which replaces Special Economic Zones. WHAT IS THE FORM OF SUPPORT? The investment can be carried out in all areas in Nowy Sącz (private and public). This applies not only to areas covered by the borders of Special Economic Zones. WHAT KIND OF INVESTMENT PROJECTS QUALIFY FOR THE SUPPORT? WHAT KIND OF ECONOMIC ACTIVITY QUALIFIES FOR THE PUBLIC AID? All companies from the traditional industry sector, with the exception of enterprises producing, among others: alcohol, tobacco, steel, electricity and gas. Some companies from the service sector. These include: IT services, research and development services in the field of natural and technical sciences, accounting and book control, accounting services (excluding tax declarations), technical testing and analysis services, call center services, architectural and engineering services . WHAT IS THE LEVEL OF THE PUBLIC AID FOR THE COMPANIES INVESTING IN NOWY SĄCZ? The amount of public aid (tax exemption) is calculated on the basis of the entrepreneur's incurred investment outlays or two-year labour costs of newly hired employees. HOW TO DETERMINE THE SIZE OF AN ENTERPRISE? WHAT CRITERIA MUST AN INVESTMENT PROJECT MEET TO RECEIVE THE SUPPORT DECISION? The investment project must meet certain quantitative and qualitative criteria in order to receive public aid. 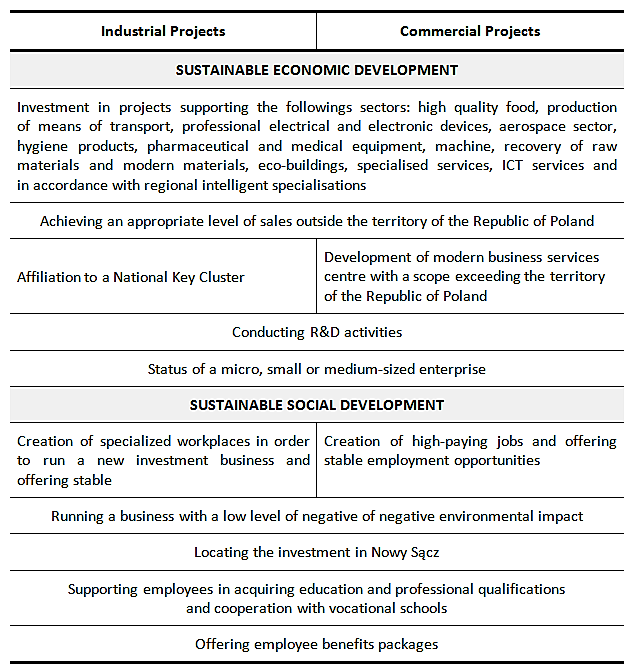 Entrepreneurs carrying out new investments in Nowy Sącz must meet at least 5 criteria in a given sector (industrial or service sector). Maintaining the conditions under which the entrepreneur received the Support Decision (both quantitative and qualitative) in principle, lasts 5 years for large companies and 3 years for companies from the SME sector. WHO MAKES DECISIONS ABOUT GRANTING THIS PUBLIC AID? Support Decision is issued on the basis of entrepreneur's application by the Kraków Technology Park (KPT) on behalf of the Minister of entrepreneurship and technology. This procedure takes about a month.